Please visit my Estate and Tax Blog that explores current and evolving issues involving wills, trusts, probate, estate administration and estate planning, tax alerts and discussions of interest. Please visit my profile, rating, questions and answers, peer endorsements from fellow attorneys and my legal guides at Avvo. The links to questions and answers answered and my legal guides also can be quickly accessed from the hyperlinks listed on the left hand column of this page. This award indicates the highest possible rating in both legal ability and ethical standards. 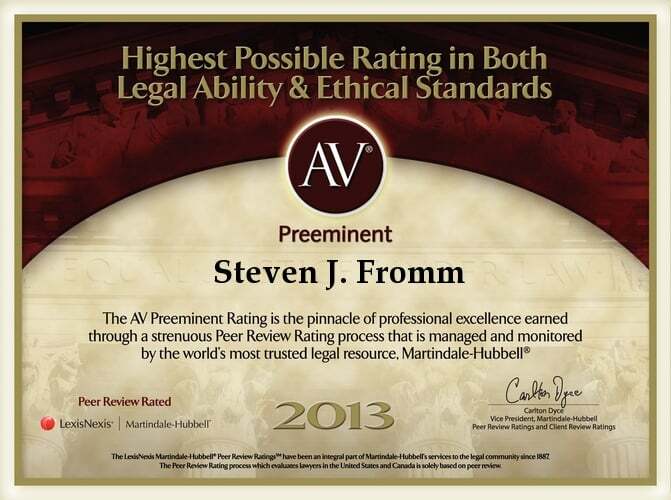 The AV Preeminent peer rating is the pinnacle of excellence earned through a strenuous peer review rating process that is managed and monitored by the world’s most trusted legal resource, Martindale Hubbell. See my profile and the “AV Preeminent” peer review rating. Please visit my Google My Business page to see over 50 recommendations or to get directions to my office. See my Yelp profile and client recommendations. Please visit my profile, personal and group affiliations and recommendations at LinkedIn. Please visit my legal profile at Cornell University Law School, Legal Information Institute. Please see Gifting Shares of Stock in a Closely Held Businesswritten by Mr. Fromm and published in the Journal of Accountancy. 2011 Top Attorney in the Readers Choice survey done by Suburban Life in the business law category. Interview with Jim Melwert, KYW reporter, about 2013 year end tax planning. Please visit the Steven J. Fromm & Associates, PC Google Plus account profile to become part of my Google + network, get directions or to see or post recommendations. Steven J Fromm & Associates, PC Facebook page. Please visit to see my interesting pictures. Please visit my Yahoo profile to get directions or to see or post recommendations. Please visit my Bing profile. Please visit my Manta Profile.